The pace has been hectic but very fun here these last few weeks. I’m helping you guys out there find stunning gifts for your girls…….and vice-versa. There is nothing quite like a gift well chosen. But that means I have had very little time to blog or answer the very excellent questions that have been arriving in my mailbox. Paula, please I need a Horse Cuff bracelet made by Carson, I already have the wolves one, so I need the horse now to match it, but I need it to be specifically made on the same exactly shape as the photo I am about to attach with this email. cs I bought one from someone else and it wasn’t exactly the way it showed in the photo. Do you send it to Australia?? Can I pay via paypal?? Can he make it for me??? I do not mind how long it will take?? How much it will cost?? So Paula i want the 4 horses to be put on this same shape bracelet on the attach, cs this one 1 here is more rounded design and I like it better, and also the engravings to be exactly the same. Thanks and I hope you can help me. The bracelet you have was probably stamped “CARSON B.” which is the hallmark for Navajo artist Carson Blackgoat. Although we have never carried that bracelet by Carson Blackgoat, I have seen them. The wolf group is a cast piece which is attached to the front of the wide cuff bracelet. The stamping on the edges of the bracelet differs between the bracelets but the wolf group is always exactly the same since it is a cast element. Now as far as the horse group, there is a cast piece that Navajo artists use of four horses galloping. Below are some examples of that horse herd as used by two different artists. Is this the group of four horses you were thinking of? So since you say you want the horse bracelet to be exactly like the wolf one you have and since these groups of animals are quite different, I wanted to make sure you have seen the horse group to see if that is what you are looking for. When you say you want it made on the same exact shape as the wolf bracelet, are you referring to the scalloped edges of the cuff? And you want the same exact stamping on the scallops? Since Navajo jewelry is hand-made, no two pieces are exactly alike so the stamping is different on every Carson bracelet I’ve seen. But the central portion with the cast piece (animal group) is always exactly the same. Finally, bracelet fit is very important for a wide cuff like this. Since you already have one that fits, measure those dimensions in inches and have that on hand as you shop. I’d suggest using a soft cloth tape measure and measure the inside circumference from end to end and the length of the gap. Have these two measurements as separate figures and also added together as total circumference as some sellers list them that way. Also measure the width. We don’t take custom orders. Here’s why. We make several buying trips each year and we choose items we feel would be good for our web store. The Native American artists seem to prefer to deal in person, not through the mail or by phone. They purchase their materials (silver, stone), then make their beautiful creations, then take them to a market somewhere to sell. They hope for a quick turnaround for their investment so they are not really set up to take a single order for a specific item and then ship it through the mail. So your best bet is to keep an eye on our NEW page and maybe on one of our next shopping trips, I’ll see a bracelet like you want. Best of luck on your search ! The Zuni define their world in terms of directions with their home and village and its inhabitants at the center of the world. Therefore, they have six directions, the four cardinal directions (North, South, East West) and the Upper and Lower Dimensions. Each region has its own guardian and often fetishes representing the six directions are placed in the home as a group or set. The mountain lion represents the North. The wolf represents the East. The badger represents the South. The bear represents the West. The mole represents the Lower Dimension or the Earth. The eagle represents the Upper Dimension or the Sky. Some Zuni artists carve all six fetishes out of one piece of stone – this is a very rare Six Directions set. Another approach is to carve one fetish, say the badger, larger and then to tie the other five fetishes, carved in a smaller scale, to the badger. A more common group is a display of the six fetishes, all in the same scale, on a natural setting such as one made with rocks and wood. Various animals represent certain powers. Although fetishes are carved from many types of rock today, fish rock is the stone traditionally used for fetish carvings. Also popular are pipestone, serpentine, Picasso marble, turquoise, jet, picture jasper, argite, lapis, azurite, sodalite, marble, dolomite, mother of pearl (MOP), onyx, and spiny oyster. See more about Stones. Many fetishes have a medicine bundle, offering bundle, or adornment tied on the back of the animal that can consists of coral seed beads, shell heishi, feathers and other stone pieces. These may be used as an offering to the fetish, to evoke the spirit of the fetish or to increase the strength of a fetish. Coral bits, from the ocean, represent marine life or the heart of the fetish. Turquoise represents the sky and water. Penn shell heishi is brown and represents the earth. Use of the six colors (see Six Directions below) white, yellow, red, blue, black and speckled or multi-colored, together symbolize the six directions. Feathers are very powerful medicine when added to fetishes, so are rarely added to rock carvings for the market. Sometimes a stone arrow is included in the bundle. It used to be these were real arrowheads but now they are small arrowheads carved out of shell. The arrowhead can protect the fetish from harm on its journey and the arrowhead can strengthen the power of the fetish. If the arrow points ahead, it protects the fetish from things it will encounter. If the arrow points backward, it protects the fetish from things that might come up from behind. The bundle is tied on with sinew, which is from muscle fiber and symbolizes strength. 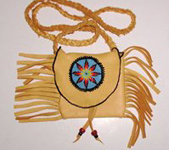 Some contemporary artists use leather or heavy beading thread. The style and detail of carving varies among artists but usually includes detail on the face, ears, tail and mane. Often the eyes and other spots of adornment on the animal are inset pieces of contrasting stones such as turquoise and coral. Single, double and triple heart lines are inset in some fetishes. The heart line is a line etched, painted or inlaid along one or both sides of the animal. It usually extends from the mouth to the region of the heart. There are many interpretations as to what a heart line represents, but it is often said to represent the pathway of the breath of the animal to the life force, which is the heart. Others feel that the heart line points to the soul of the animal. It is thought that a heart line gives the fetish healing or medicinal power.